At his southern California home/vineyard/winery, Chad explained that because oil companies were reaping large profits, a lot of uneducated people think they are villains. Though he ultimately came to the conclusion that oil and gas fulfill a necessary need; his ambitions are now taking him to a different place — a place where he reflects on the values of his family, on serving the community, on benefitting the planet and, of course, being an opportunist, on making a profit. My desire to do something different started with an eco-friendly limo business in Las Vegas. Here’s a chance for an oil guy to provide more energy resources from renewable sources: bio diesel and natural gas. It’s self-gratification with a business like that, running on renewables… and it gives you an edge over the competitors. Why wouldn’t they do the same thing? It doesn’t really cost that much more, it’s just an initiative. It’s like recycling, it takes a little more effort, more consciousness to do it. The limo business sharpened his interest in more eco-friendly ventures, acting as a springboard to expand into the sustainable foods frontier. A generous supporter of many non-profits, Chad met Chef Stephan Pyles at one of Stephan’s fundraising events for Share Our Strength No Kid Hungry Project. The godfather of southwestern cuisine and a founder of the Chefs Collaborative, no food from Stephan’s many kitchens goes to waste. As their relationship grew around Stephan’s many initiatives, Chad saw a green behind the green. Stephan’s philosophy of cooking seasonally, procuring foods from sustainable producers and supporting local farmers has created 21 profitable restaurants. Chad invested in three of Stephan’s Dallas establishments, Stephan Pyles, Stampede 66 and the recently opened San Salvaje. October 2013, Stampede 66 was named by Esquire magazine one of the top 20 new restaurants in the U.S. This experience with Stephan influenced Chad. Wanting to connect to the land, he moved his family to farmland just outside Temecula, California. I’ve always been on the healthier side and so the prospect of a healthy style of living is what started it. We are a close-knit family, three kid’s ages 8 to 17. The kids go out to pick table grapes and grapefruit and come back to squeeze them for themselves. Our dinner table is a great setting for a family environment. We fell in love with this area and so bought this property. Up here you either have horses or vineyards. We can do horse riding down the street. I love the look of vineyards, more for cosmetic reasons… wanted to enjoy the atmosphere and look out from my balcony seeing the vineyards. Chad planted an acre of Cabernet Sauvignon and Merlot, 800 vines each, installed solar energy, water wells and has plans to triple the number of vines. When he started, he had no idea so few vines were capable of producing over 1,000 cases of wine. So a new hobby ensued and the Santa Ramona Vineyards began. 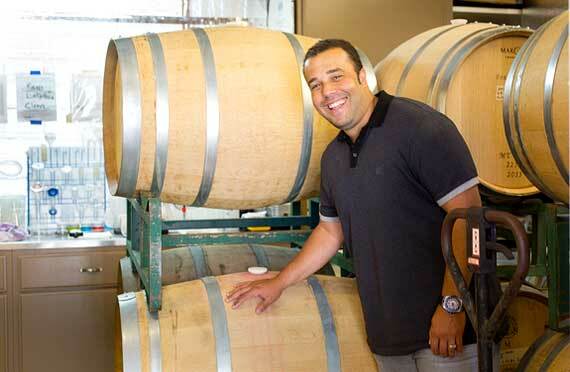 Adamant about learning the craft and doing it right, Chad hired local winemaker, Eric Erno, to develop the wine. “We spent a lot of money to buy all the equipment and converted the garage, along with an additional three-car garage, into a winemaking facility,” he explains. Touring the grounds with Chad, wife Gabriela, Eric and Chad’s organic farmer/brother-in-law, Juan Herrera, the vineyard scenography is an orchestrated dance of rolling hills, planted vines, fruit orchards and vegetable gardens. Eric indicates that it takes three years to get workable fruit, plus 24 to 26 months of fermentation and aging in French oak barrels. The beta harvest was in 2012. The focus was on a single variety of Cabernet. The logistics to ferment the Cab and Merlot were to be done separately, but the crew picked a bin of Merlot and by mistake threw it into the Cab bin, and so by default, created a field blend. For the past 30 years and for the love of wine, the Orange County Wine Society has held a competition for non-commercial winemakers. Eric wanted feedback on their young wine and so submitted their 60 percent Cab/40 percent Merlot blend to the annual awards program. To their surprise, they won the silver award, and, to follow, placed bronze in the WinemakerMagazine International Amateur Wine Competition, and silver in the Del Mar Fairs Wine Tasting Competition. Chad’s hobby vineyard can produce roughly four tons of wine grapes and about a half ton of table grapes annually. This allows them to make 700 gallons of wine, or 300 cases. Chad’s dream is to grow it to 1,000 cases annually — expanding from hobby to yet another successful business. His plan is to produce high quality wines with old world values, from grapes grown on the same land using resources that allow growing and producing sustainably from harvest, fermentation, storage, aging and bottling — 100 percent estate wines. The character of the wine is finding itself one glass at a time, just as Chad is evolving one successful, sustainable business at a time.